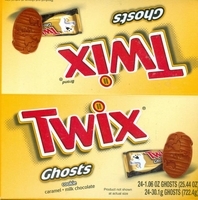 Twix ghosts. These are perfect for anyone who likes Twix candy bars. What's not to like cookie, caramel and chocolate all in the shape of a ghost. Bite into a crisp cookie with gooey caramel all covered in a creamy milk chocolate. What's not to like. Buy your Twix ghosts before the disappear. Each box has 24 1.2 oz candy bars.